Today we promoted Detective Jansen and Sergeant Clary. Detective Damon Jansen was promoted to the rank of Sergeant. Jansen has been in law enforcement for 20 years. He has been with RPD for 15 years. His last 11 years was spent in detectives. 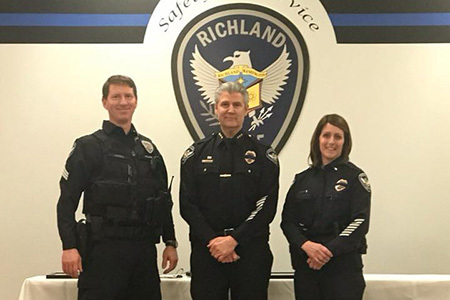 Jansen has also served Richland PD as an EVOC (Emergency Vehicle Operator Course) Instructor as well as a Defensive Tactics Instructor. Sergeant Brigit Clary was promoted to the rank of Lieutenant. Clary has been in law enforcement for 21 years. Clary lateralled from Federal Way to RPD two years ago. During her time with Federal Way, Clary was a Lieutenant for Major Crimes as well as Field Training Officer and Drug Recognition Expert Instructor. Congratulations to both of these amazing leaders. Thank you to Benton County, WA Sheriff’s Office, Kennewick Police Department, Pasco Police and Richland Fire & Emergency Services for participating in our promotional ceremony.